There is a movement out there advocating the idea that the recent trend of school violence, and indeed the increase in violence in general can be directly tied to the law banning institutionalized prayer in schools. TV personalities have made the claim time and again and graphics and verse like the examples above have flooded the internet and continue spread this claim regardless of the fact that it is, as I’ll show, entirely groundless. 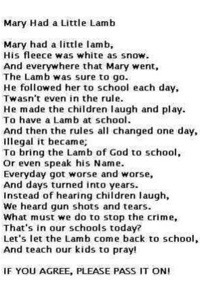 One of the most ridiculous aspects of this argument is the simple fact that it is NOT illegal to pray at school. There is no ban on holy books, not a single yarmulke or burkah has been burned, and no students have been searched for prayer beads and rosaries. All that the law in question states is that there can be no organized school mandated prayer. Even if it were not the law wouldn’t such a position be the only sensible one given the diversity of culture and outlook in schools today. It’s a law meant to recognize the fact that not everyone prays the same way, or to the same deity and indeed that not everyone prays. It’s a policy that removes one more division between children, one more opportunity for someone to be excluded. – St. Pius X catholic high school Ottawa Ontario 1975. In spite of a lack of prayer ban a student killed 1 and injured 5 before turning his shotgun on himself. – Oikios Christian University in California. 7 dead 3 injured in spite of what one has to believe were several heart felt prayers. – in 2006 six an Amish schoolhouse was fired on. No deity came to the rescue of the 5 little girls that were killed or the 6 injured in spite of the famous piety of the Amish. – a Sikh temple was the sight of the shooting of six temple goers in Wisconsin in 2012 regardless of the regular prayers featured there. These are just a few examples to demonstrate that freedom to pray (which I remind you no one ever took away) doesn’t stop crazed gunmen. 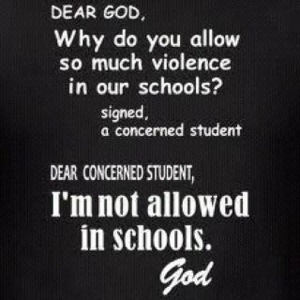 Perhaps the people who spout these slogans and circulate these graphics are saying that more prayer in schools would lead people to act less violently. Let’s consider whether religious instruction or affiliation curtails violence. As you read this right now there are gangs of devout Buddhists led by holy monks engaged in bloody fighting with what they would call “Muslim aggressors” throughout Asia. Muslims, who pray 5 times a day by holy law, are involved in those same conflicts as well as conflicts in Palestine, Israel, Iraq, Syria, Europe and North America. Fundamentalist Christians, some of the most ardent proponents of prayer you’re likely to meet, are the same groups that bomb clinics, and lynch homosexuals. It doesn’t seem as though prayer is dampening the violent impulses of people very much, and in each example I’ve chosen those likely to pray more than average. It would appear that in many cases the fervour that fuels their prayer is the very source that energizes their violence. We’ve seen that prayer doesn’t protect one from violence, and it doesn’t stop people from being violent. Yet we’ve barely touched on the bucket of errors in this simplistic way of thinking. It should be obvious to anyone who considers it that just because one thing follows another doesn’t mean that the first thing caused the second. This is a logical fallacy so old it has a Latin expression “post hoc ergo propter hoc” or “after a thing therefore because of a thing” by this reasoning the increase in violence in North America which has happened since the late 1950s can be as easily attributed to the addition of “in god we trust” on American currency as to the law against forced prayer. The fact is human society has always been violent and it is usually at it’s usually at it’s most violent in the times and places where religion is unchecked and prayer is compulsory. Could it perhaps be the case that the increase in violence is the result of the fact that there are more weapons and more people in closer quarters to each other than at any other point in history? I also consider it important to point out that prayer is out of place in school. Schools should be places of fact and knowledge where we prepare children to deal with the concerns of this world. There are more than enough temples and churches where anyone who wants to is more than free to educate their child on their theory about the next world. In the end there is no good foundation for the belief that more prayer would lead to less violence. There is however every reason to believe that if studied the results would be the same as studies of the effect of prayer on health. Most of the time it has no effect, and sometimes it makes actually makes things worse. 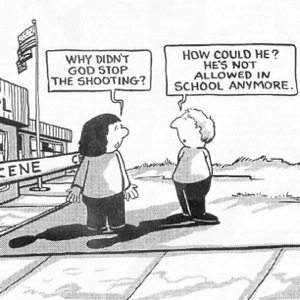 Posted on October 26, 2013, in Editorial and tagged Christianity, Islam, logic, Prayer, religion, school, school shooting, violence. Bookmark the permalink. 6 Comments. Great post. I’m afraid, though, that your soundness will be missed by the deeply religious. Logic isn’t their strong suit. Thanks, I’m glad you enjoyed the post. I fear you’re right about the deeply religious reader though to be honest I’ve quite given up on them. I hope, perhaps in vain, to reach the less ardent religious audience. DxVictory lies in convincing the closet secularists that it’s ok to stand and be counted. Thanks for commenting. Great article, but violence has always been on the decline. The “things are always getting worse” mentality is only true if you watch tv, where the goal is to report as much bad news as possible. I’ll be looking more closely into that area of the article as you were not the only commenter to make that point. It’s always nice to be able to learn something as well as share my own viewpoint. Thank you for taking the time to comment.